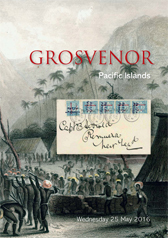 A specialised auction of nearly 700 lots, featuring the Martin Baxendale Collection of Tonga, the Michael Parr Collection of the Territories of New Guinea and Papua, fine Cook Islands, Samoa and the Greg Willson collections of British Solomon Islands and Gilbert & Ellice Islands. Please note there will be no viewing available on the 24th May. Private viewing will be available from the 3rd May. Please telephone us beforehand to arrange an appointment.